I would say I typically read more young adult fiction than adult fiction, and the adult fiction I do read is mostly suspense and psychological thrillers. 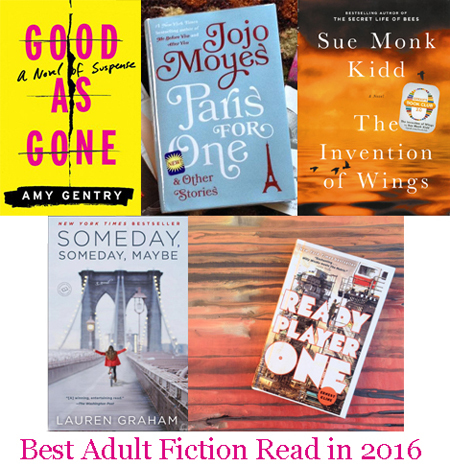 Surprisingly, the top 5 adult fiction books I picked for the year are pretty different across the board. Good as Gone by Amy Gentry (2016). Julie was kidnapped from her house when she was 13, but the circumstances were very suspicious. She was never found, but suddenly appeared on her parents’ doorstep eight years later. Except several people don’t believe that this is the real Julie, and they have evidence. This book jumped around between points of view, seemed to introduce random characters, and basically did a great job at making sure you didn’t know what to believe as truth. It was very well done and very interesting to read. Paris for One by Jojo Moyes (2016). I love Jojo Moyes' characters because they're so well-developed, so realistic, and so... cozy. The title novella is great to immerse yourself in, and the following short stories are pretty quick, with interesting twists and some surprise endings. I read it in one sitting and loved it. The Invention of Wings by Sue Monk Kidd (2014). I read this because it was one of Oprah’s Book Club picks and I needed it for my Pop Sugar Reading Challenge. I was SO glad I picked this one, because it was amazing. I’ve read Sue Monk Kidd before and loved it, and this one was no exception. It is based on historical figure Sarah Grimke and how she fought for slaves’ and women’s rights. The narrative was told from her point of view, as well as the point of view of Handful, a slave the Grimke family owned. I’m usually not into historical fiction but this way beautifully done and inspired further research on my part. Someday Someday Maybe by Lauren Graham (2013). I love Lauren Graham, mostly as Lorelai Gilmore, so I was worried I was going to imagine that character as the narrator in this book. Luckily the story is about Franny trying to make it as an actress in New York, and she’s silly and funny, so imagining Lauren Graham as the character totally fit. I love reading about people trying to make it as actors, so I loved this book. The overall resolution was a little obvious, but there were nods throughout the book that Graham knew what was going on, so it seemed a little less hokey. The ending itself was very well-written. I’d love to read more from her. Ready Player One by Ernest Cline (2011). I loved this book! It was recommended to me by a friend who said I’d like it even though I don’t like sci-fi. To clarify, I don’t like hard sci-fi. I like things that seem like they could happen, like dystopia and robots and establishing human life on other planets. This book was amazing because it could be read as a statement on the direction society is headed - so much is done online, not face-to-face. Life seems so great on Facebook but it’s not in reality, etc. Wade basically lives in the OASIS, an online world that’s better than the real world, especially considering that, in the real world, people live in trailers stacked on top of each other. He squats in an abandoned van to log in to the OASIS and become Parzival, an avatar who is still in high school, but is searching for the egg the OASIS creator left encoded in the game before he died. I don’t want to give too much away, but this book totally sucked me in, and I already want to re-read it! I recommend it to everyone, especially people who don’t like sci-fi, because it will blow you away. With the movie version being released in 2018, you might as well read it now so you can see it when it comes out! If the adaptation is well done, I think the movie could be just as great as the book. I've been wanting to read Ready Player One and LG's books, so I'm glad you like them all. Plus you've given me some new books to add to my TBR list. I agree about Moyes's characters feeling cozy too! I think Ready Player One might be my favorite of the year, honestly. So good! And since it was scifi, I didn't even think I'd like it! It won me over.